Back in March last year I spent some time comparing the Countryman 8x42s to the (now discontinued) ED-X and Hawke's Frontier EDs. At the time, as I still am now, I was very impressed by the Countrymans. The time has come to look more in depth at 3 sizes the Countryman range, the 8x32, 8x42 and 10x42. 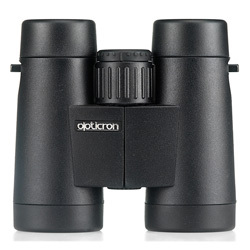 10 and 12 times magnifications are available in a larger 50mm diameter binocular too, though these aren't on test. A foggy morning provided a good opportunity to put the Countrymans through their paces. You may find other reviews available which assess binoculars with resolution charts and other 'lab' tests, great if you want to know how they may fare after 12 hours in a freezer (yep, you read correctly) but perhaps not so useful to discover what they're like in the field. A humble Robin perched atop a shrub 20 feet away as I begun, the 3 binoculars all at hand, side by side, ready for comparison. I picked up the 8x32s first and thanks to the tactile, smooth turning focus wheel, had a crisp view in next to no time. The detail these binoculars achieve is outstanding, the feathers on the little Robin were well defined and the glint in his eye as he sang his territorial, autumnal song was clear to see. A dewy cobweb in the periphery of 8° field of the view caught my eye and with sharpness maintained up to about 75% of the view, I only needed to adjust my view a fraction to get it as clear as possible. Thanks to phase correction and Opticron's 'Oasis' prism coating (similar to dielectric coatings), the brightness and contrast was excellent, even though the 8x32s don't gather as much light as the 8x42s. As the Robin continued to bellow out his song, I tried with both the 8 and 10x42s, again noting a very high level of clarity. At 7° and 6° respectively, the field of view on the 8x42s and 10x42s are lower than that on the 8x32s, though neither feels constricted and each is around average for their size. Again, there is some softening at the edges with the 42mm models but both boast a very decent sweet spot. Unlike their nearest rival from Hawke, the Sapphire EDs, Opticron's Countryman range does not feature Extra-low Dispersion (ED) glass, so you would expect to find some colour fringing (Chromatic Aberration). On this front, the 8x42s are clearly better than the 8x32 and 10x42, as I could only notice a small amount of fringing on objects against the white sky when they were at the edge of my view. Within the centre, I could barely notice any CA at all which was a pleasant surprise. The 8x32s were second best in this test and I found it most noticeable on the pair of 10x42s. I found Opticron's close focus specifications of 2.8m on the 8x32 and 2.3m on the 8/10x42s were absolutely spot on. The Countrymans are 100% made in Japan, where the standard of build quality is generally considered higher than most that come from China. Even at a glance they look well made and certainly when you spend a bit of time with them you come to appreciate the subtle differences that make these binoculars feel that bit more reassuring. The long eye relief, twist out eye cups just seem to glide up and down between stops and sit as firm as a rock when they're where you want them. The dioptre is located on the front of the focus wheel and clicks out to adjust and back in the lock, something you'll hardly ever need to do but at least leaves you with no chance of accidentally turning it. The well gripped focus wheel, as mentioned already, is a dream to turn and requires just a fraction under 2 full turns from close focus to infinity. They are nitrogen filled to prevent fogging and provide waterproofing to a depth of 3m, though I haven't gone to the trouble of testing that fact... With a 30 year guarantee, Opticron are evidently pretty confident about the build quality too, and I have to put it down as one of the Countryman's real strong points. Comfort wise, the 10x42s are the heaviest of all 3 models at 701g, but this is still relatively light and certainly doesn't feel a burden in use. At 614g, the 8x32 is by no means light (or compact) for a 32mm model but are still a tad less than the 8x42s (which are 682g). The Countrymans feature a durable textured 'natural' rubber armouring which always provided me with ample grip in use. The standard roof prism bridge between the oculars wasn't intrusive and provided a place to rest your fingers with perhaps your 'pinkie' over one barrel. 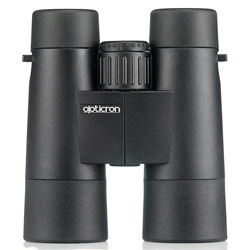 I still prefer a well designed open-hinge binocular (such as the Opticron Verano) for comfort none-the-less. Optically, what they do, they do very well. It's what they lack that left them with an 8 for optical quality and I'm know I'm being pedantic giving them that. The 8x42s would be my choice, with the best light gathering capability and handling of chromatic aberration compared to the other two, but I feel they could offer a bit more than a 7° field of view. I also appreciate the ED glass on rival binoculars, as well as generally a slightly better close focus. That being said, however, to feature all those little extras and to have them made in Japan would surely add a significant increase on to the price tag, so it's a compromise, where build quality has come up trumps. Give me a choice of these vs Hawke's Sapphire ED 8x42s and I'd be debating it for days, perhaps longer. The Sapphires hold the edge over the Countrymans optically (in my opinion) but the Countrymans are built and feel that bit nicer... Either way, they certainly represent fantastic value for money.